The first time I went to La Casita was earlier this spring, after craving Mexican food for weeks and not knowing where to find it in Taipei, a quick google named about 3-4 places. I called first, asked when they closed, and they said if we came over that they would stay open for us (I think it was about their afternoon siesta time). I went there with a friend, and he asked the owner for his recommendations for us. We had nachos to start, chicken enchilada for me, and beef burrito for him. He said that his ground beef burrito tasted similar to a meximelt from Taco Bell (which he likes, so it was sort of a compliment, meaning that what the owner chose for him was appropriate). I also was craving chicken enchilada, so we were quite pleased with what the owner recommended. We left satisfied and happy to return again to this mom and pop mexican hole in the wall. We also thought it was a funny coincidence that the owners were relatives of a friend of a friend. Our most recent experience however, was unfortunately not quite the same. I called first, confirming the address and asked if we had to make reservations for 4-5 people. She asked when we were coming and I said that we were leaving soon- and she said that she would set the table for 4 and add a seat for the 5th person if we needed. I said that was fine. We arrived in different taxis and I was excited to introduce this hidden place to three friends. When we arrived, there were about 4 other customers there occupying 2 tables, and the place is pretty small, with about 4-5 tables in total. The menu has a selection of appetizers, including chips, nachos and quesidillas, then an assortment of burritos, chimichangas, tacos, enchiladas and combo plates which include a side of rice and beans. There are also fajitas, margaritas and desserts. Like most mexican or tex-mex places in Taiwan, they charge you for chips, salsa or any accompaniments. We ordered nachos to start, with beef, guacamole and salsa (all additional separate charges) which made them about $10 US. The chips were crispy and topped with nacho cheese, beef and jalepenos. The cheese was like nacho cheese, maybe like the kind you would find at the movie theater, or melt yourself at home from a jar, rather than shredded cheese that was melted on top. The guacamole and salsa looked homemade, and the portion came in a small side bowl. The salsa was pretty spicy, but you can tell them what level of spiciness you want when you order your dishes. It was a decent sized plate of chips, but not enough for five people to share, so we had to order another set. Because La Casita is a smaller place, everything is basically run by the two owners and their family. They take the orders and then go back to the kitchen and make it. They have two daughters (I think) who come and bus the tables and bring over dishes when they are ready. So you have to have an open mind with the service and be patient since each dish is being made by one person. The atmosphere is cute and quaint with murals along both sides of the wall, and signatures of previous customers raving about the food or their visit, and making their mark that they were there. It's entertaining to read while you are waiting and you may find a name or two that you recognize. I ordered a chicken enchilada and chicken chimichanga combo. Overall, I enjoyed the dish- the chimichanga was crispy and the shredded chicken in both were tender. The enchilada had a good amount of cheese and sauce and last time the owner said that the corn in the corn tortilla were made from purple corn. However, the dish was topped with sour cream, which I don't like, but scraped to the side, and no guacamole and a tiny bit of salsa (which I thought I saw came with enchilada). I also found the dish overall to be a bit salty as did some of the other people that night. I finished most of the food, including the rice, which I liked. The refried beans were a bit dry and I left more than half of that on my plate. The other three people got various assortments of combo plates, which were mostly finished, though I have to say I was disappointed that one person's order was wrong- he ordered a beef burrito and chicken taco and got the reverse, a beef burrito and a beef taco. Our dishes all came one at a time, and we were pretty much all finished by the fifth person's fajitas came. This was a combo of it being the fifth dish, as well as being shrimp fajitas, I think. When the shrimp fajitas finally came they were not peeled and the heads were still on the shrimp. It looked more chinese than mexican, and the friend whose order it was said it tasted that way. In addition to us all staring at him because we were done and we were curious, he later said the shrimp tasted funny so he had it packed to go. He actually also requested that we stop by Burger King after we left and he ordered a sandwich. The other thing about that night that left a bad taste in my friends' mouth was that once our food started to come, the restaurant had emptied out. We were cramped into a table for four with five people (four guys) and asked the owner if we could move one of the empty tables to adjoin ours and create more space. He seemed to be in a bad mood and responded "You made a reservation for four." which actually was not true- I had talked to the other owner and explained the situation when I called. The table _was_ occupied when we came, but was now available, as well as the rest of the restaurant. He was more rude than accomodating, as well as when I went to order the extra nachos, he pointed towards the kitchen, rather than accepting the order himself. Later on, he went outside and stood outside grumpily and walked around. This left quite a bad impression on my friends, who felt that he shouldn't have come that day if he was in a bad mood, and it was definitely a contrast to the last time he had greeted us. So unfortunately, I would say, that if you are really really craving mexican food- you can stop by La Casita. But don't go with a larger or odd numbered group, don't order the fajitas (if you want fajitas, Chilis and TGIF actually have good fajitas) and maybe even get your order to go. I was going to take pictures, but I was kind of scared- maybe the next time if I can convince someone to go with me! I was introduced to Salsa Bistro when a friend hosted his birthday party there. I have to note that we got terribly lost when trying to find it- the way that I listed the address may be different than how it's listed on other sites. In Taipei, a lot of smaller restaurants are on lanes/ or alleyway streets which are offshoots of the main street. So Salsa Bistro is No.9 on the Lane, not on the main street. No. 9 on An Ho Rd is actually near another restaurant, Pasta West East. When we finally arrived, there were delicious appetizers waiting for us. I would definitely recommend what we had, which was pumpkin bread and sauteed shrimp, both of which came with supplemental green and red sauces. At first, I thought, pumpkin bread- that sounds strange and imagined something like banana bread. But it was more petite and like a starter bread with more flavor and texture. The menu has a good selection of meats, seafood and pasta. If you order a main entree, you can choose 2 of 4 accompanying side dishes: banana fries, rice, croquettes or vegetables. Jeff decided to get the half roasted chicken and I got the pork loin. Both were great selections- they were tender, flavorful and a good portion. I also sampled some of the lamb from a friend and that was equally good. The sides were good flavors to match, but I was slightly disappointed with the amount. The banana fries were more like banana dollars, but they were crispy and sweet. I didn't care too much for the croquettes- I found them kind of bland, but the rice was good. The atmosphere was romantic and quaint- the whole restaurant was about ten tables or so, and you could see the kitchen and servers. The service was prompt and courteous. We also ran into some friends there who brought business guests from Japan, so it's a great place for any occassion. I would definitely go there again and with friends. Be sure to double check the address with the restaurant anytime you are going somewhere new and have the phone number handy! kid friendliness: not kid-friendly, smokers & second hand smoke everywhere since it is a hotel pub bar with mostly business-men. Sometimes you just want to eat a steak sandwich with fries. If that's the case, then you head over to Cheers at the Grand Hyatt hotel, even though it will end up costing you about NT$440 with the service charge, which is about $13 for a steak sandwich with fries. But it will be one of the best American steak sandwiches you can find in Taiwan- the steak is grilled and seasoned just right, accompanied with sundried tomatoes and grilled onions. The roll is the perfect combo of crunchiness and softness, slightly toasted and soaking up the juices of the steak. The portion of fries are generous and make me drool just thinking about it- they have a crispy texture asking to be dipped in ketchup. Though pricey, I would also recommend their beef taquito appetizers. They are on the larger size, sliced in half, so that there are 6 servings. The taquitos are hot, flaky and crispy, and accompanied by guacamole, sour cream and salsa served in little silver serving bowls. They are not too spicy, although a little filling, so order them if you are in a larger group. They are better taquitos than you will find at the other mexican restaurants I've tried in Taipei. 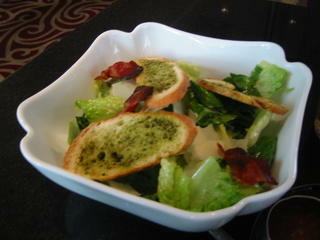 The caesar salad is also a good bet and a good starter. The romaine lettuce is crisp and fresh, and it comes with bread croutons with pesto sauce. 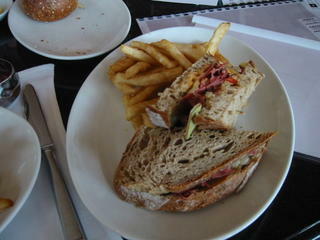 My friend got the Reuben sandwich with fries, which has pastrami and cheese on a rye toast. The club sandwich is also really good here, with slices of turkey, avocado, bacon, tomato and ham piled tall. The atmosphere is like a hotel pub or restaurant, with leather booths with white linen tablecloths and napkins, large windows, and a bar area. Many of the customers are businessmen meeting for drinks or coffee, and it often gets smoky since there is no non-smoking section which is one of the drawbacks for me. 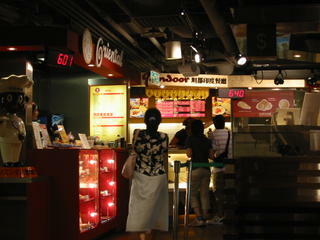 The menu features a few appetizers and mostly American foods like sandwiches and burgers. It is on the pricey side since it's in a hotel, but the food and service is very reliable. Especially when you feel like a steak sandwich. I was very excited to hear about Macaroni Grill opening up nearby when I came back, even though I had probably only eaten there a few times in the states. But it was another place for US style salads, pasta and pizza! The two other occassions we ate at Macaroni Grill were good- check out the other review (Italian)- but on this occassion, I was craving pizza, and craving it right away! I called and asked what their selection was for my pizza to go- trying to decide between BBQ and asked if they had mushrooms on it. 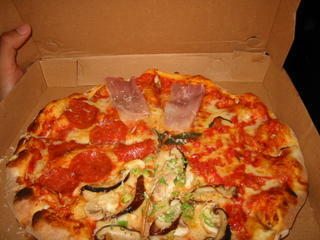 The hostess recommended their Four Seasons pizza, which was mushroom, tomatoes, canadian ham, and pepperoni. I imagined it to be a combination pizza, but when I picked it up, I discovered, it was literally four flavors on one pizza, with each flavor getting its own section and a couple slices. This would be a great recommendation for people who want to share a pizza, since the vegetarian and meats are separated, unlike a combination pizza, or someone who couldn't make up their mind on what to eat. I will admit I was pretty hungry by the time I got to eat this pizza- they said it would be ready in 10-15 minutes and it was ready faster than when I picked it up. They even called to let me know it was ready. The pizza tasted SO GOOD! The crust was the right combination of soft and crispy, unlike a lot of pizzas made in Taipei, where the crust is either too thin and crispy or too doughy. The tomato sauce and cheese were the right amount and right flavor, not too salty or bland, but just like what you would expect of a restaurant type pizza. The toppings were proportional to the pizza, just the right amount and I liked all the 'seasons' except one- the pepperoni hit the spot, the tomato was surprisingly refreshing, kind of like bruschetta on your pizza, and the mushrooms were fragrant and delicious! There were both shittake and white mushrooms on it, and the flavor was like they lighlty sauteed them and then put them on the pizza before it baked. I didn't like the Canadian ham or prosciutto or whatever it was- it was too salty and hard to eat. If I ordered it again, I would ask them to sub in any of the other flavors for those that section. It was about $12 US for the pizza, a bit more than CPK or what it costs in LA, but about average for restaurant pizza here. My old favorite places for pizza here were Pasta West East (which recently I don't like their pizza as much anymore) and Cosi O Cosi, which I will have to taste again. In the past, we also tried Auntie Sue's pizza (not to my liking) and long time ago, I had Domino's/Pizza Hut here. Be forewarned- if you try pizza in Taipei, you will likely get some toppings which we aren't used to, like corn or peas or seafood. Some people like it, but I prefer pepperoni and But the next time I'm craving pizza, my first choice will be Macaroni Grill! PS- they have a website for Macaroni Grill which lists the location for the Taipei restaurant. If you want to see what the menu is probably like, you can check out the menus for the other US locations, though each restaurant has its own variation. I thought this was a good place to at least figure out what they probably had. Since I discovered Indian food at Berkeley, I have to have it every so once in awhile. I really enjoy the variety of what Indian food has to offer- from the different types of chicken curry- especially chicken tikka masala- to the tender flavor chicken tandoori to the vegetable sides like eggplant or aloo gobi, and of course freshly made naan! 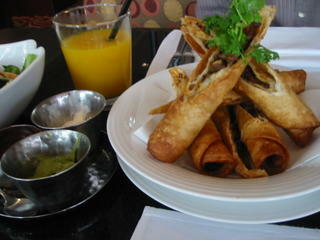 Recently, I have been ordering samosas too, when I'm not at the lunch buffet. I used to hit the Indian food spot in Century City mall, until a few month ago, I drove there and discovered they had closed down. For lunch buffets, there is one restaurant I go to regularly in Westwood, as it was in walking distance from my old office, and another in Las Vegas. I was impressed with Tandoor when I went to their main restaurant location in Taipei (I think the first and only Indian restaurant I have been to Taiwan) especially as there were customers there who were also Indian. So I was pleasantly surprised to find that they had branched out into mall location, offering quick and inexpensive alternative to a sit down one. The server that day was a woman that spoke both fluent English and Chinese. I was surprised, since she looked part Indian- perhaps she was part Chinese or just adapted really quickly to working and living here? The menus are clear, with lots of combo offerings, and one sample combo shown in person. I decided to get the chicken tikka masala combo, which came with a side of vegetable curry, rice, naan, a samosa and a drink. I thought it was a good value for about $7 US. The samosa was smaller than typical appetizer size, but hit the spot. The samosas that I've eaten here in Taipei seem to be similar in that the skin is like won-ton skin rather than what you'd find in LA. It makes it kind of a fusion flavor- maybe to accomodate Taiwanese tastebuds? The naan was soft and crispy, great for dipping into the curry. The rice was colorful and slightly stickier than saffron rice, but I've had lots of different kinds of rice. The chicken tikka masala had the right amount of spiciness and sweetness, but was a little more watery than I would have liked, and the chicken pieces were bitesize. 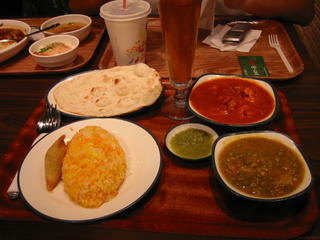 The vegetable curry was spicier than the chicken, and also a little too watery. The peas and tomatoes were good accompaniments to the rice and chicken. The drink was a ice tea that came in a fun tall glass and was a refreshing sweet cold drink to the curry. If you are looking for a quick fix for Indian food, I would recommend the mall Tandoor. If you have the time, I would go instead to the main restaurant. I have to admit I'm one of those people who tend to order the same things when I go somewhere, especially if I've had it before and I like it. I end up not being adventurous and trying other things for fear of not liking it as much as what I've had before. That being said, what I usually order when I come to Chili's are fajitas or the chicken cajun sandwich. The menu has a lot to offer, including a lot of appetizers, salads, pastas, sandwiches, burgers, fajitas, and entrees, as well as a lot of festive drinks and desserts. There's also a separate menu or ads where they have pictures. They don't have their signature Awesome Blossom onion rings at the Taipei location, but you can check out a sample menu from their official website. They have both English and Chinese menus, and you just ask if you want a particular one. Most of the servers can understand English too, since it's a popular place for foreigners and families- they should defintiely at least be able to understand your order in English. We went to Chili's for July 4th since we were semi-celebrating the holiday with a pretty large group, about 9 people. Our server was pretty nice and accomodating for it being so busy. I ordered the fajita combo which is both chicken and steak, and comes with tortillas, guacamole, salsa, cheese and sour cream, which was about $600 NT or $18 US. 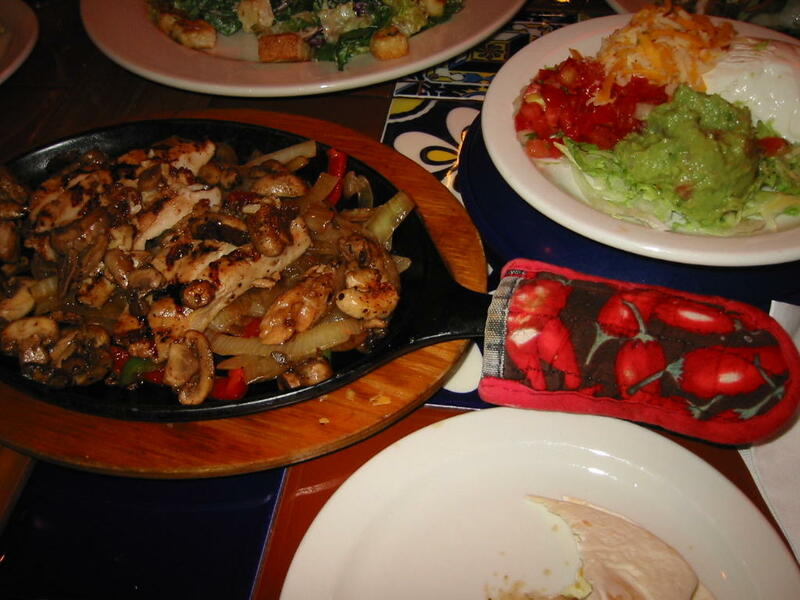 You can also get just chicken or steak, as well as the mushroom jack chicken fajitas which are also really good. Though it's quite pricey for fajitas, the flavor and portions are always good, and the guacamole and salsa taste like they should- fresh, restaurant-quality and enough for all your fajitas. You can definitely share the combo fajitas with a friend and order something else to share. Also- Chili's offers various lunch specials everyday, where they include a drink and soup/salad with your entree for a lunch special price, and they often include fajitas in that. Another popular dish which was ordered that night, and I had two bites of was the Southwest Cobb Chicken salad- which comes with chopped iceberg lettuce, sliced boneless fried chicken (I think you can ask for grilled chicken), corn, bacon, diced hardboiled eggs, cheese and tomatos or pico de gallo. The dressing is an avocado-ranch dressing. It's huge and enough to share, and a pretty typical cobb salad. I don't love salads with iceberg lettuce, so I couldn't eat it as an entree, but I think it's a good salad to share as a starter. I usually call and make a reservation for larger groups, as it gets quite crowded for lunch and dinner. Note there's also a smoking and non-smoking section, which is good for me, since I hate sitting near smokers. Once when it was really busy, I just requested to eat at the bar, and I got sat right away- which is something to ask if you are in a hurry and are by yourself. The atmosphere is probably standard-issue from corporate Chili's, since the decor and TVs and uniforms are just like you would expect at any Chili's. 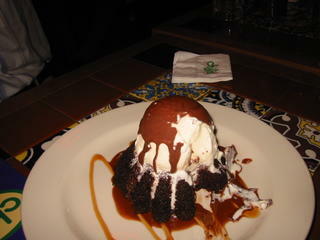 For dessert, we chose the Molten Chocolate Cake and the Chocolate Chip Paradise Pie. The Molten chocolate cake is very dangerous- it's a warm chocolate cake with a gooey chocolate center, a huge scoop of vanilla ice cream covered with a shell of chocolate topping it. I would go back there for dessert alone. I used to love the warm chocolate cake they served at Cafe Tu Tu Tango, but they took it off their menu. Not only does the cake melt in your mouth, the ice cream is the perfect accompaniment and the chocolate shell on top reminds me of when we used to squirt that stuff on our ice cream at home. YUM! The pie was dense and sweet, with more like a brownie made up of caramel, coconut and chocolate, topped with ice cream. It was also sizeable, but the better value or bet is probably the chocolate cake. Both desserts were around $300 NT or $10 US. I also went back for lunch on the 9th and ordered the Cajun Chicken sandwich lunch special-you get a soup or salad and a drink with it (around $300 NT or $10 US). I actually like the chili soup there- it's the right texture with ground beef, beans and tomatoes in it. Your other choice for soup is usually Broccoli and Cheese soup, which is like eating nacho cheese with bits of broccoli in it. The cajun chicken sandwich comes with a spiced, grilled chicken breast with jalepeno jack cheese, fried onions, chipotle-ranch sauce, and the typical tomato, pickle, lettuce. 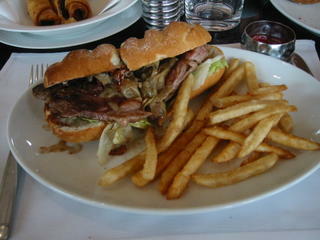 It's a pretty big sandwich which is cut in half (or comes with a steak knife) and a side of french fries in the basket. Usually the fries at Chili's are really good- steak fries that are crispy, hot and right amount of salt. Mmm- fries. I like the chicken sandwich better than the hamburger because I like the flavor of the chicken and somehow the hamburger didn't hit the spot the last time I ordered it. The bun is also a little bit sweet, and I tend to tear off pieces of it to save my carb calories for the fries. I mistakenly ordered a lemonade before I ordered my entree, which is not refillable so therefore not part of the lunch special drinks, so I ended up with both a lemonade and ice tea. The lemonade ($100 NT or $3 US) is made with sparkling water or soda water, and was a bit salty or too fizzy, and they were very accomodating to make a new one and the bartender came over and asked what was wrong with it. I asked that it be less fizzy and more sweet, and the second attempt was pretty good. Their refillable beverages come in a huge mug and they come by pretty frequently to check on you. That's one thing I have to give to Chili's is that they have pretty good service, even with larger groups. Also- there are families with kids or businessmen there, so the seating is accomodating enough that you are comfortable and not on top of each other. The food generally comes pretty fast and around the same time. So for my friends visiting from the states, you probably won't want to eat at Chili's, but rather the mom and pop dumpling and beef noodle places. But for my local friends- see you there!